With ivory enamel inlay and detailed three-dimensional designs, these divine cross ornaments will make a fitting favor for your next religious event. 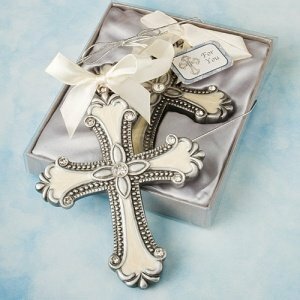 The classic cross shape is crafted from silver colored poly resin, then accented with ivory enamel and brilliant clear rhinestones on one side of the favor. We finish each piece with an ivory satin ribbon tied to the top for easy and stylish hanging. The 4 1/4" by 3 1/2" favors are packaged on a bed of silver satin inside a clear-topped gift box with silver base, silver metallic elastic cord and cross-themed "For You" tag. The 4 1/4" by 3 1/2" is the dimension of the favor itself not the box. how much does the cross weigh? The Pewter Cross Ornament with Enamel Inlay weighs 0.22 lbs.